The kind of love that Merton describes isn’t the soft, romance-novel kind of thing that many of us as children believed love to be: the handsome knight in shining armour and the beautiful golden maiden, living happily ever after. And even when we grew out of that incomplete image and into the range of adult human love that the ancient Greeks called storge (familial love) and filia (loving friendships) and eros (intimate love), still these wonderful, life-supporting and necessary elements of human love aren’t yet what Merton and his tribe of wise elders are referring to. No, this love is much, much more than that: stronger, tougher, more demanding of us. It is about accepting, being involved, respecting, honouring, letting go of our egos, caring, and a myriad of other things that don’t look fancy or exciting – or sell romance novels. It is made up of many elements, but sentimentality isn’t one of them. 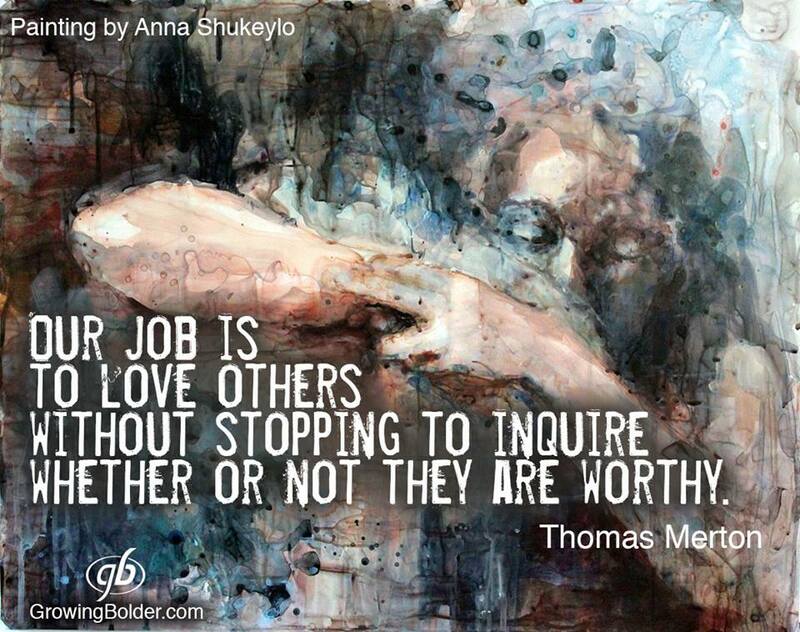 The love that Merton describes, called agape by the Greeks – this universal, selfless love – isn’t just a feeling. Agape is all about choice, one that doesn’t depend solely on the flutterings of the heart. Furthermore, this altruistic kind of love involves not just an initial choice, but a continual choosing, one that we have the option to renew a thousand times a day as we go about our lives in the world. Or not. Agape isn’t easy. In fact, it may be the single most difficult learning we humans go through in a lifetime, because in order to practice it, we must, with each choice, overcome our pettiness and our laziness and our attachment to our precious opinions and our easy judgements about others. We have to let go of so many things – how easy to simply not bother! Nevertheless, it remains the insistent call of Spirit to our deep self, the whisper that we can only hear if we take the time to listen closely, the touch we almost don’t feel as it lands, light as dandelion fluff, upon our shoulder. And then there are the many times when the best we can do is catch glimpses of it in the actions and wisdom of those people who are so much farther along that path of loving than we are. But no matter that we’re not spiritual giants ourselves; we’re called to it anyway, in our own ordinary life each day. We’re called to choose agape with each person who crosses our path, whether or not we, in our “wisdom,” consider any of those people “worthy.” We practice to the extent that we’re able. What’s more, agape asks of us that we continue through all the years of our life to stretch and to grow, painful as that can often be, so that we may become more, and more, and ever more able. It’s a pretty tall order. The wonder of it is that anyone chooses it at all.